Hey everyone! I'm just a 17 year old kid from Monson, Ma puttin' in the work to be the next big thing. I started riding at a really young age, but it was just scooting around the house. It wasn’t until I was seven that I did my first woods race and it went on from there. Up until I was about 12 all I did was race woods. I didn’t care about winning, I just had fun racing with my Dad on the weekends. 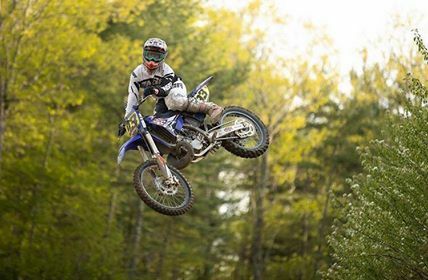 I did my first moto race up in Derby, Vermont at a track called Rider Hill in 2012. I was beyond nervous, but ever sense then I have been in love with the sport. It wasn’t until 2016 that I decided that this is something I would consider doing as a career, so I figured that if I was gonna go for it, might as well do it right! I Began to pick up speed here and there, but I was not a smart rider at all, which resulted in injuries here and there. Up until 2018 I was fast, but not very consistent. Once I was healed up I knew I needed to buckle down and prepare myself better than I ever have; mentally, physically, and nutritionally. Working out daily, eating very nutritious food, and puttin’ the time in that is needed. Let’s just say it’s been a heck of a year so far, and I am beyond proud of where I’m at. Lots of hard work, dedication, and discipline have been involved within my program, but and let me tell ya, it pays off. One thing I truly believe everyone should know is, if you truly want to do something you have all the tolls you need even when you think you don’t. It matters how bad you want it and what your willing to put into it! I began riding at the age of two back in 2003. I was bought my first motorcycle and it went on from there. It was a KDX 50, and the thing wouldn’t even make it up my yard. From there on the bikes began to progress in size as I became more attached to the sport. Brandon has opened a lot of eyes this year including some big wigs at FXR Racing. Brandon scored himself a sweet set up and sponsorship with the FXR Racing team. Now he'll be stylin' like the best of them. My grandfather and father got me into the sport. Neither of them raced, but they very much enjoyed the time they did spend on bikes, just riding around the back yard as father and son. They decided to get me my first bike, and from there on it is what I have always loved to do. How has your 2018 season gone so far? My 2018 season has gone very well so far, but I truly believe it is because I have put in more work than my fellow competitors. I’ve built confidence within myself, I am mentally tough, and I am able to ride consistent which is a big part of my program. Most of the time I am just racing locally around New England. But, I was able to qualify for the 2018 Loretta Lynn Amateur National Championship in Tennessee. I qualified through the Unadilla Regional in New Berlin, New York. It has been a great year so far, and I can only look forward to what is in the future. What were your goals coming into 2018? My main goals coming into the 2018 season were to become a smarter and faster rider, but also to enjoy the sport a lot more. It has always been a dream of mine to qualify for Loretta‘s. With the effort that I was able to put in at the beginning of the year and continuously put in up to this point now, I was able to get myself two tickets to the Ranch. My mental coach and I, Jay Cavanaugh came up with some smart goals for the season, my first one was to qualify pass the regional, and my second one was to compete at Loretta Lynn’s. I am very much looking forward to racing on the big scene, and look forward to myself progressing more and more throughout the year. Brandon is no stranger to wins. On any weekend Brandon can run with the best of them and looks to be on par with some of the fastest amateurs in the world. Yeah, for sure this year I partnered up with RAK Racing. The leader behind that is Jay Cavanaugh, and he has taken the position of being my mental coach. Jay has helped me immensely, as we continuously work on becoming a better rider, never focusing on just one thing. We always are looking to progress forward and improve week in and week out. We work on mental toughness, physical strength and endurance, along with eating nutritious food. I try to ride about three times a week, but it’s very difficult working full time, but if I’m not able to get to the track I always am working out and doing endurance training. I work on working out my core, training my body to withstand immense heat waves while at my peak as well. The biggest thing about my program this year is my father for sure though. He has helped me out immensely from the beginning. If he feels that I need to ride, it's not an issue. If I need something, not an issue. If it wasn’t for him I would not be anywhere and he is literally the reason that I am the way I am. He is just as important to my program as I am actually doing the training, if not more. But, overall my program has remained organized and always planned out ahead of time, allowing me to train for success. A big part of my success so far this year is that I truly believe I am unlike most of my competitors, I don’t need to be pointed in a direction, I am aware of what I need to do and I know if I do it, even if it is challenging it will pay off. What are some of your highlights for 2018? 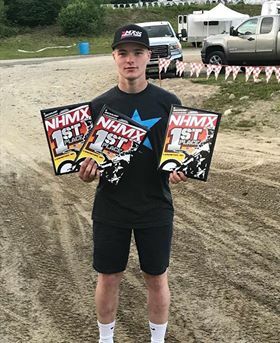 You were one of the very few lucky riders to get the "golden ticket" to the holy grail that is the Loretta Lynn's Amateur National in not one , but two classes. What was that feeling like when you qualified? It was unreal, I was so proud of myself and my dad from the time we have put in, and all of it finally paid off. When I crossed the finish line into 250 B stock, I didn’t know what to think. I knew mathematically I qualified, but I didn’t think it was true. As soon as I exited the check in point, I asked my dad if I qualified. He said, “your in.“I was so pumped and actually got pretty emotional to be honest along with my dad. When I qualified for the second class, 450 B stock, it was amazing, but it definitely did not feel like the first one. It was like I knew I deserved it, I just couldn’t believe I actually did it the first time. But, the second time I knew I could and that’s what I did, I went out there, pulled the hole shot and settled into second with the main goal in reach! You can always tell Brandon is having fun on his motorcycle from the style and enthusiasm that he displays each time he throws his leg over the bike. How are these Loretta's qualifiers different from other races? These Loretta Qualifiers are different because of the added pressure put on them. Along with attracting faster competitors, which is awesome. It adds a new component to racing, allowing you to progress as a rider with the help of faster riders. I feel as though Loretta qualifiers wouldn’t be that stressful if you have the opportunity to do more than one. I think if you have the ability to do multiple you have a wicked advantage, but, even with a disadvantage I was able to qualify in two classes which I worked extremely hard for! What are your goals for Loretta's this year? My goals for Loretta’s this year are pretty straightforward if you ask me. My main goal heading into the National is to do my absolute best and to never give up even when I am pressured. I feel as though I have earned a top 10 position without a doubt, but I want and I am working towards a top-five overall finishing position. I’ve put the work in, I’ve been physically and mentally challenged, and I have improved my discipline. All of which is all setting me up for success when I arrive at the Ranch! You were selected as TCE's first AM rider to represent the brand at Loretta's, what type of involvement do you hope to have with TCE and it's Pro riders? I am honestly completely stoked to be the first amateur rider to be a part of The Collective Experience. I really feel that I’ve already built a connection between Dave and I. We haven’t known each other long, but I feel we are very similar, both uplifting, positive people. The biggest thing I’m looking forward to is learning the ways of the pros. To get an understanding of what goes on throughout the day, what I should be working on in order prepare myself for when that time comes. Along with some of the mental and physical challenges they face throughout the day, things I can work on now, to give me an advantage in the future. I am beyond stoked to truly be a part of such a cool group of people, I really appreciate Dave giving me a chance! Brandon has a lot of support in his corner and hopes to make everyone proud with great results in Tennesse in August. Who are some of the people who support you throughout the year? Throughout this year so far I have gained more support than I have ever within my whole career. Before this year I had only one or two businesses helping me out, but now with the results I have produced and the work that I put in I’m getting recognized by many bigger businesses. I am partnered up with Aggressive Graphics, a graphics dealership out of Massachusetts with unique graphic designs. Flow Vision goggles out of California, who helps me out immensely with awesome deals. REP Suspension out of Hampden, Massachusetts who has been doing my suspension for multiple years now. I recently partnered up with Jay Cavanaugh, owner of RAK Racing. He is a huge part of program and I truly appreciate all his hard work and dedication toward myself. I am also working with The Collective Experience. Dave is just willing to do whatever he can do to benefit myself which is absolutely mind blowing. Offering parts, recognition, whatever it is. Another company I’m pumped to become a part of is FXR, a gear company I have always thought looked wicked cool and allowed me to join their family and no longer have to worry about looking sick! But, along with all these guys who help me out immensely I can’t forget my Dad, and Tom Ledger at the Moto Lab for getting my bikes dialed. Thanks guys, really appreciate it! You've definitely got the talent and passion to progress within the sport. What is your ultimate goal with racing? My ultimate goal within racing is to be a top Pro racer. A lot of people bash on ya when you even mention going Pro let alone being the one on top. But, there’s no reason if you ask me why I’m not capable of doing it. With how much I have progressed in less than a year blows my mind. I truly feel if I show what I am capable of at the right places, and continue to show my work ethic, I can truly be one of the best out there on a factory team. What advice or insights would you give a young kid looking to have racing success as you have as of late? The biggest thing I would say to a little kid coming up through the ranks, is to have fun. Yeah, it’s repetitive, it’s said a lot, but it’s true. Only ride if you wanna ride, that’s when you’ll notice yourself progressing a crazy amount. Don’t put to much pressure on your self, the more prepared and calm you are, the way more competitive you will be, and always remember we all started somewhere. I was a just a little kid having fun in my backyard not too many years ago. Now I’m going to compete at the biggest Amateur National in the World. Choose what you wish to do in life, and go after it!